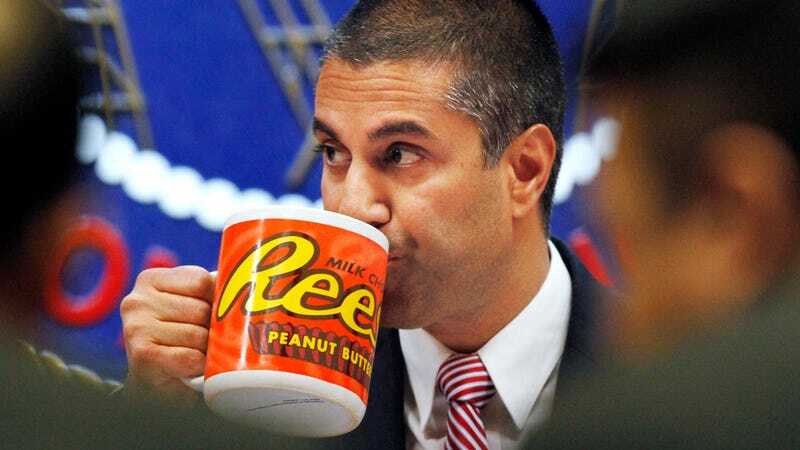 Ajit Pai, pictured here at the 2017 meeting where the GOP-controlled FCC voted to gut net neutrality rules. Federal authorities have arrested the former CEO of an Alaskan telecoms firm—who just so happens to be the very individual Federal Communications Commission chair and telecom flack Ajit Pai tapped to run a broadband advisory panel—on charges that she tricked investors into pouring $250 million into a fraud scheme. Elizabeth Ann Pierce, who served as CEO of Quintillion Networks LLC , allegedly convinced two investment companies that the firm had secured contracts for a high-speed fiber-optic system that would generate hundreds of millions of dollars in future revenue, the Manhattan U.S. attorney’s office and FBI said Thursday. The system was pitched as one that would provide service in Alaska and connect it to the lower 48 states, authorities said. Between May 2015 and July 2017, Ms. Pierce provided the two New York investment companies with forged broadband capacity sales contracts totaling about $1 billion to persuade them to invest in the fiber-optic system, according to a complaint unsealed Thursday in Manhattan federal court. According to the Verge, Pai tapped Pierce to serve as chair of the Broadband Deployment Advisory Committee (BDAC) in 2017. BDAC was formed for the purpose of “reducing and removing regulatory barriers to infrastructure investment,” which given that it was staffed almost entirely by industry shills, seems to have been a euphemism for helping the FCC gut local oversight of telecoms networks. Broadband industry advocate group Stop the Cap noted that Pierce secured the BDAC role after “publicly complaining” about supposed red tape in the Alaskan broadband deployment process. Quintillion values its partnerships with customers and investors and the alleged actions of Ms. Pierce are not aligned with how Quintillion conducts business. The ongoing investigation has not impacted Quintillion’s operations nor the quality of its services. Quintillion continues to move aggressively to extend its network and provide world-class telecommunications to Alaska and beyond. Gizmodo has reached out to the FCC for comment, and we’ll update this post if we hear back.